Listen to my Original Album on Bandcamp here: "HeartSong of the Phoenix"
I Directed a fully staged version of UNDER MILKWOOD for The Dublin Shakespeare Society to celebrate Dylan Thomas' Centenary recently. It was a sell out production for all nine performances & we received Standing Ovations each night of the run. I was also acting in it, performing the roles of Second Voice & Rosie Probert. 7/04/14 I am thrilled to be playing Lady Macbeth from Tuesday 8th of April until Saturday 12th of April at Teacher's Club Theatre for the Dublin Shakespeare Society in their production of MACBETH Directed by Tim Casey. Here is a link to my friend's website John Lockley Xhosa Sangoma, Medicine Man, Shaman who is running some amazing workshops in Ireland soon. 06/01/14 Performed & Sang as (Molly Bloom) with Val O'Donnel (Maestro) & Shane Egan (Blazes Boylan) as The Joycean Trio at the Annual Dead Dinner for Joyceans in the Teachers Club. 27/12/13 Here is a VIDEO of some TV work on UNA's DREAM TICKET on RTE2 as Professional Vocal Coach to Kayleigh Noble, talented young singer. 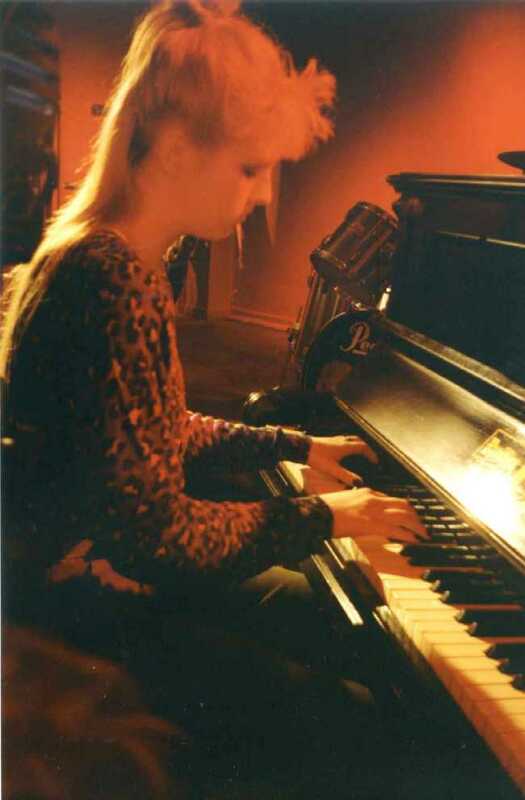 14/06/2013 Played Kathleen Kearney in James Joyce's A Mother adapted by Val O'Donnell in the United Arts Club, Playing live Piano, Singing & Acting. 18/12/12 Have just finished Performing with the Dublin Shakespeare Society in their production of Uneasy Lies the Head that Wears the Crown Directed by Paul Maher. 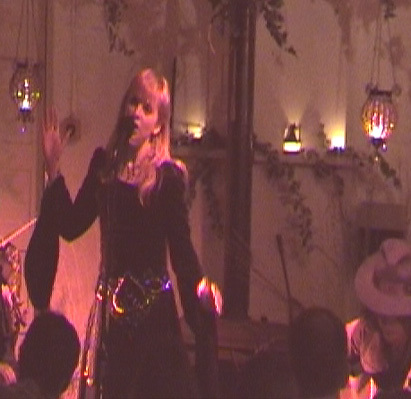 I played Richards II's Queen & Singing ArchAngel, performing 10 songs live during the show each night. 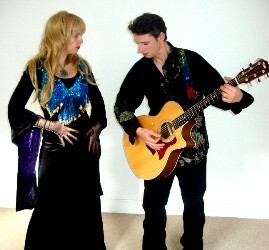 02/05/12 Here is a LIVE VIDEO performance of myself & Georgia Theresa performing RIVERMAN by Nick Drake recently. 30/04/12 LIVE VIDEO Performance of CRAZY MAN MICHAEL (by Richard Thompson & Dave Swarbrick.) with Catherine Morgan in Áras Chrónáin at CEOLTOIR SESSIONS. Here is my VOICE OVER DEMO as I also work as a VOICE OVER ARTIST in Radio, TV Adverts. 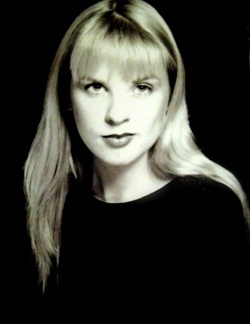 NIAMH O BRIEN "AT CLOSE RANGE FILM SCENE"
NIAMH O BRIEN "IN AMERICA FILM SCENE"
NIAMH O BRIEN "HEAT FILM SCENE"
NIAMH O BRIEN "BORN ON THE FOURTH OF JULY FILM SCENE"
Here is my MYSPACE page. 30/01/07 Featured half hour, live radio interview on the "Declan Meehan Morning Show" on Eastcoast FM, "Breathe Again" is played. 4/05/06 "SealSong on Rathlin Island" is the featured song on the Wild Dolphin Foundation Society in Hawaii. 25/08/04 Review in MQ (Music Quarterly) The IMRO Magazine says "...Speaking of Kate Bush, who hasn't released an album for many years, the opening track on the debut album by Kildare singer-songwriter Rhíannon shows that Bush isn't the only female who can indulge in verbal gymnastics ... So MQ wonders if Rhíannon might win favour with a market Bush might not be reaching any more?" 14/08/04 Jackie Hayden reviews "HeartSong of the Phoenix" in Hot Press magazine saying ... "On "Breathe Again" her Vocal Gymnastics are immediately reminiscent of Kate Bush ... You may also get flashbacks to early Celtic Folk singers like Maddy Prior too ... The Joni-esque "Coyote Kisses" shows that Rhíannon has real potential ..."
1/04/04 Rhíannon’s song “Breathe Again” is played on the Ronan Collins Show. Achieving National Radio Airplay it receives an excellent response from the public with lots of e-mails flying into the show requesting that it be played again. Rhíannon's original name is Niamh O’Brien and she is from Ireland. 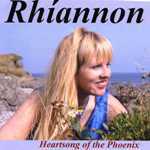 She adopted the stage name Rhíannon to launch her solo career as a Singer/Songwriter. Niamh, also known as (aka) Rhíannon also works as a Professional Actress in Ireland. She has Full Equity Card and is a member of IFTA and IMRO. She also works as a Voice Over Artist for TV, Animation & Radio Adverts. Over the years she has tread the boards in all the top theatres in Dublin …The Gaiety, The Olympia, The Tivoli, Andrew’s Lane in various productions. In Oct she has just finished acting in a Shakespearian production in Dublin playing the roles of Lady Macbeth, Gertrude from Hamlet, Helena from A Midsummer NIght's Dream and Regan from King Lear. 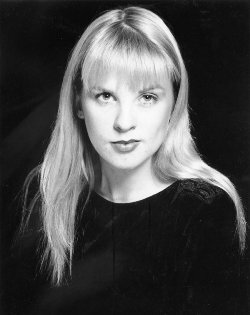 She has also acted in many shows in the Dublin Theatre Festivals e.g. “Mary and Lizzie” by Frank McGuinness, directed by Jo Mangan of Performance Corporation, and “The Plains of Enna” by Pat Kinevanne, directed by Jim Culleton of Fishamble Theatre company. She sang with the National Chamber Choir, the Dublin Chamber Choir, RTE Philharmonic Choir and ANÚNA. During her time with ANÚNA she toured both Nationally and Internationally performing in many countries. The Royal Albert Hall at the London Proms ’99 was a particular highlight, as was appearing on the Gloria Hunniford Show for the BBC. She sings on many recorded CD’s already, with the National Chamber Choir “On Christmas Night” and with ANÚNA “Cynara” ; "Essential Anuna"; "Christmas songs"& "Anuna 2002" and with Meav Ni Mhaolchatha on her CD "Celtic Dreams", with Enda Reilly on "Halloween Lady" and with Janet Harbison on "Honour & Glory". She also performed and sang for both Presidents Mary McAleese and Mary Robinson in Áras an Uachtaráin. Her Film and Television work includes RTE’s "Fair City" and a Live appearance on the "Late Late Show" and "Live at 3" and the role of Catherine in “The Last Bus Home” an Award Winning, Irish Feature Film Directed by Johnny Gogan. In Short Films she has played Karen (Leading Lady) in "Food" (Horror) Directed by Sergio Vilchez; Elena Baird (Leading Lady) in "Natural Predator" (Thriller) & Dark Princess in "Coyote Kisses" (Music Video) and various other roles in Short films & Music Videos. She is an accomplished Director too and received great acclaim for her Professional Production of “Under Milkwood” by Dylan Thomas in Andrews Lane Theatre, which she Directed and in which she also played Second Voice. Michael Bogdanov, the Artistic Director of the English Shakespeare Company came to her Opening Night and was full of praise for her Direction Skills. She has Directed many Original pieces of Theatre for the Pavilion Theatre, Dun Laoghaire, in one off performances , the most recent being her own Devised Pieces i.e. “Salvador Dali’s Dream” and “Earth, the Stomping Ground” which she also Choreographed. She was awarded a Scholarship to The Irish Film Academy on their Directing, Screenwriting and Digital Film Making course for her writing and creativity. As a piece of trivia, she directed Damien Rice as John the Baptist in a scene from Oscar Wilde's "Salome" many years ago. She also studied Acting for Film and the Meisner Techni que with Terry McMahon; Rachel Sarah Murphy; Ferdia MacAnna; and accents with Poll Moussallides. Currently she is working on her Musicianship and has taken up Mandolin, Mandola and Tin Whistle recently as new instruments in her playing repertoire. She already plays Piano, Guitar, Bodhrain. Her Primary instrument however is her Voice. She is also an accomplished Artist and Designs all her own Artwork for her CD’s and her Web Site. 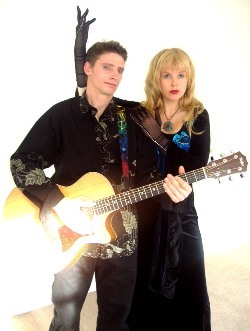 These many talents weave together and their fusion goes into creating the Rhíannon Alchemy! 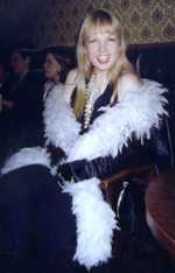 5/02/04 Rhíannon appears as the special guest at . 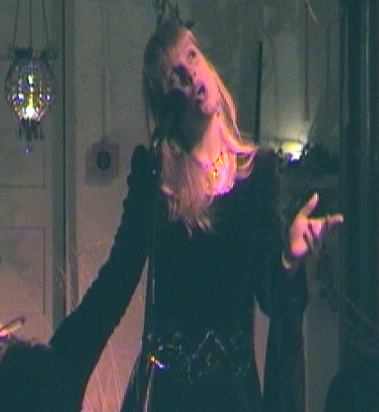 . .
24/01/04 Rhíannon sings at the AFRI conference on Human Rights, other performers involved were Luka Bloom, Steve Cooney, Laoise Kelly and Eithne Ní Chatháin. "Moon Goddess Shines during Lunar Eclipse"
Rhíannon is an artist in many dimensions. 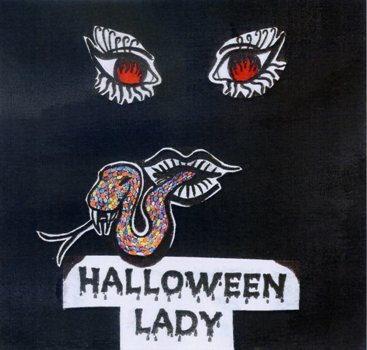 She explores depths of emotional expression with highly original lyrics and creates a magic of her own. 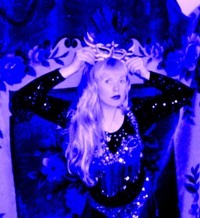 In live performance she conjures up dynamic characters for each of her songs that leap into life and imprint themselves strongly on your subconscious. For her inspiration she draws on the passion in Celtic Mythology and the Magic of Dreams. She believes in the limitless possibilities of imagination and isn’t afraid to take risks. Her involvement in her work is total. She expresses herself through music, lyrics, visual image, dance and totemic movement. Her theatrical background as a professional actress, gives her an amazing stage presence which exudes power. Strong emotions and passion are the predominant energies at the heart of her music. Her songs are charged with emotional force. As well as singing her own original songs she also sings traditional Irish ballads 'as Gaeilge' and in English. Open your heart … Open your imagination … Dare to dream … Dare to make the leap … Rhíannon will enchant and bewitch you!